Here's your new t-shirt/sticker/desktop wallpaper. Tell the world. OMG! WTF? Was I asleep? Had I slept? Did I miss something? Does paleontological training destroy the part of the brain that knows how to use a freakin’ tape measure? Are paleontologists incapable of imagining that others might want to make meaningful comparisons with their taxa? Has phylotardation reached the point where people think the character taxon matrix contains all relevant information? Somebody throw me a bone here–so I can measure the damn thing! Way back when, I discussed the question, “How big was Futalognkosaurus?”, which at the time had only been described in one fairly brief publication (Calvo et al. 2007). Nothing wrong with that, lots of dinos get described that way, and little damage is done to science as long as the follow-up descriptions do eventually appear (sometimes they don’t). But Calvo et al. (2008) put out a longer description of Futalognkosaurus the very next year, for which they are to be commended. It’s not all roses, though. You’ll recall that one of the problems with the original paper was that it didn’t include many measurements, and the scale bars in the photographs and the skeletal reconstruction disagreed wildly. I was hoping that Calvo et al. (2008) would include a table of measurements; actual measurements of one of the most complete large titanosaurs would be invaluable for those of us who are interested in body proportions, neck elongation, mass estimation, and all that good stuff. But sadly the second paper contains no table and almost no measurements; again, it’s all done with scale bars, and since many of the figures appear to be identical to those from the first paper, the precision of the scale bars is hard to determine but possibly low. It blows my damn mind that a century ago people like Charles Whitney Gilmore and John Bell Hatcher could measure a dinosaur to within an inch of its life, and publish all of those measurements in their descriptions, and lots of folks did this and it was just part of being a competent scientist and doing your damn job. And here we are in the 21st century with CT machines, laser surface scanners, ion reflux pronabulators and the like, and using a narf-blappin’ TAPE MEASURE is apparently a lost art. This vast inexplicable deficiency is not limited to any one working group or country or continent or language, either. Nigersaurus is known from multiple specimens and has been the subject of three separate peer-reviewed papers spread out over a friggin’ decade, but good luck trying to figure out the dimensions of the individual bones. Dammit, people! Tape measures. Tables of measurements. These are dead simple, cost almost nothing, and add measurably to the usefulness* of descriptive work. From now on, when people describe sauropods and don’t publish any measurements, said omissions will be trumpeted here and the perpetrators will be savagely mocked. With so many offenders, it’s a bit unfair to single out Calvo et al. for scorn. I am glad that they provided a longer description, which is more than I can say for many. And I have to give them mad props because both Futalognkosaurus papers are freely available at Proyecto Dino. But someone had to get the Wonka ticket in the MYDD! lottery, and they won because I’d been so looking forward to the follow-up paper so that I could answer the original question. Someone with a tape measure and a plane ticket to Argentina (or Beijing, or Chicago) could do a crapload of useful science. Sheesh! Calvo, J.O., Porfiri, J.D., Gonzalez-Riga, B.J., and Kellner, A.W.A. 2007. A new Cretaceous terrestrial ecosystem from Gondwana with the description of a new sauropod dinosaur. Anais da Academia Brasileira de Ciencias 79(3):529-541. Calvo, J.O., Porfiri, J.D., Gonzalez-Riga, B.J., and Kellner, A.W.A. 2008. Anatomy of Futalognkosaurus dukei Calvo, Porfiri, Gonzalez-Riga & Kellner, 2007 (Dinosauria, Titanosauridae) from the Neuquen Group (Late Cretaceous), Patagonia, Argentina. Arquivos do Museu Nacional, Rio de Janeiro 65(4):511-526. Dear Gods in their Respective Heavens, YES! When reviewing papers, I nearly always have to add a comment about including (even in the freaking supplementary online data) measurements of key skeletal elements. It’s not that hard, folks. Steel tape and a set of calipers (depending in the taxon and element) and you’re golden. We actually had to spend time on our Supersaurus description dealing not only with the dimensions of our animal (and the BYW specimen) but with others “estimates” of sauropod length. YES! It needs to be repeated as a mantra! I remember times when in each Russian publication there were tables with accurate measurements. Now I see the tendency of use not only damned scale bars, but also even to a proportion (1/3 of nat. size). YES :) So funny. I laughed my arse off as soon as I opened the page. I think what’s going on is the following thought process: Everyone wants to know the total length of every new dinosaur, which is totally childish and of no interest to science; there’s nothing else anyone would ever need a measurement for; therefore publishing measurements is a waste of space & time; therefore better don’t do it. I don’t need to spell out where the logical fallacy lies. Oh, and, lots of scale bars in the literature are wrong one way or another. Not only is it amazing how many morphological descriptions lack basic measurements, but the sheer percentage of quantitative analysis-focused papers that don’t present their supporting data is also flabbergasting. This was understandable in the days before online supplementary information, but there really is no excuse now (aside from the willful attempt to prevent others from reproducing one’s results). I will be the first to admit that I have had one or two papers with this flaw (my hartebeest sinus paper is probably the biggest offender), but have resolved to repent for the remainder of my career. Without having time at the moment to look at the papers, can I just quickly ask is Futalognkosaurus bigger than Argentinosaurus? THANK YOU, MATT!!!!!! 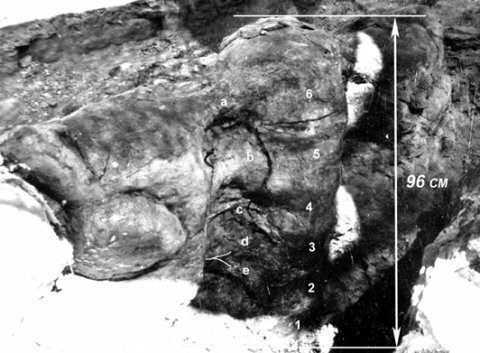 And while I’m at it, stating that a fossil in a photograph or drawing is X times life size is not that helpful, considering how easy it is to alter the size of the original document. And while I’m at it, stating that a fossil in a photograph or drawing is X times life size is not that helpful, considering how easy it is to alter the size of the original document. I wonder how many of the papers that had such statements instead of scale bars or measurements were actually printed at the intended size. In the vast majority of cases there’s probably not even a way to find out if you don’t hold the fossil in your hands. Calvo, J.O. ; Juárez Valieri, R.D. & Porfiri, J.D. 2008. Re-sizing giants: estimation of body lenght of Futalognkosaurus dukei and implications for giant titanosaurian sauropods. 3° Congreso Latinoamericano de Paleontología de Vertebrados. Neuquén, Argentina. But personally think that the best way to generate a serious investigation is preferable get the information of first hand. BTW Matt congratulations on looking so YOUNG and angry in that photo. 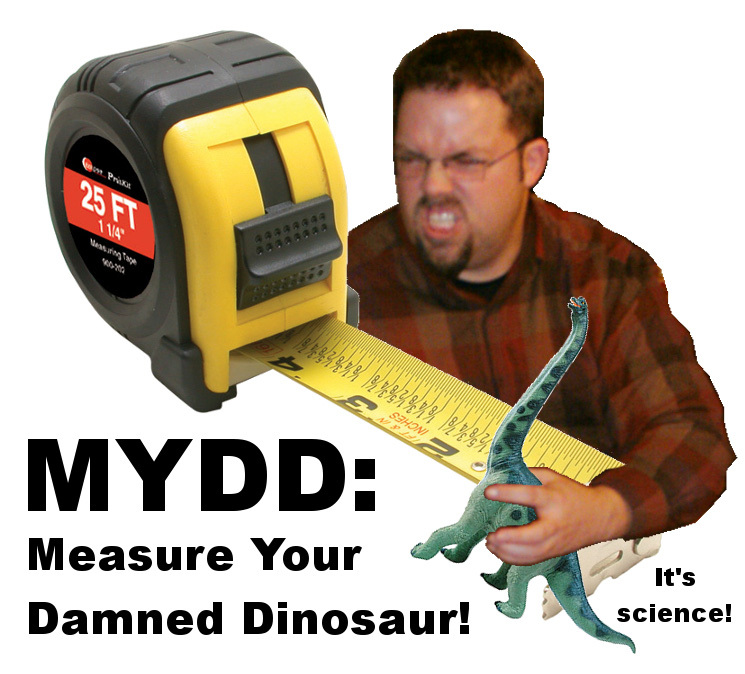 No, really – and it’s not all down to your holding a model dinosaur, and being dwarfed by the tape-measure. BTW where can I get a tape-measure that size? That is AWESOME! ..and so just exactly what’s needed for measuring sauropods! You know, I really love those steel tapes that you can extend to stand up unsupported high into the air. Saves messing about with ladders..
Matt, you are 100% correct! Measurments are important, contray to what David said. And they can help determine the characteristcs of each bone. It’ll help in reconstructing the specimen (which I need since I am an artist). It seams cladists don’t like to take measurments. Part of the problem is editors trying to reduce the size of papers for publication. I’ve frequently been told to take lists of measurements out of papers that depended heavily on those measurements for publication. I also got blackballed by a senior faculty member for complaining that his undergraduate student’s thesis didn’t have a table listing any of the data on which her statistics were based, so her thesis couldn’t be considered to be of the highest quality (he wanted her to get a thesis award). In the face of such ignorance, it’s hard to get people to recognize that they need to publish their measurements whether or not the editors force them into it. Editors asking measurements to be removed from an MS should largely be irrelevant these days given the advent of electronic supplementary information. As an author, I would certainly push back against any editor who tried to limit the length of this online archive. I’ve even seen authors post their own Suppl Info on a personal or institutional website if the journal does not maintain their own SI archive. P.S., Tracy – I could be wrong, but I think I detect just a hint of sarcasm in David’s post. You’d better watch yourself with a tape-measure that large. It could take your arm, and your tiny dinosaur’s head clean off mid-rectraction. All you have to do is have someone put out an article for (say) Unexplained Mysteries saying that the dimensions of the Sauropod vertebra follow the golden mean and that you can derive Pi from it and also the table of elements and a star map of Reta Ridiculi. You’ll have a host of willing volunteers line up, drooling, ready to discover the secrets and measure those bones. Measurments are important, contray to what David said. You’ve misread me. I tried to explain the fallacious reasoning that’s probably going on in the heads of those who don’t measure their fossils. Incidentally, I had a look at some Cope papers yesterday. No illustrations, but fairly long tables of measurements. Given the text and the table, you could probably draw the skulls he described, with reasonable accuracy. What? We use quantitative characters all the time.